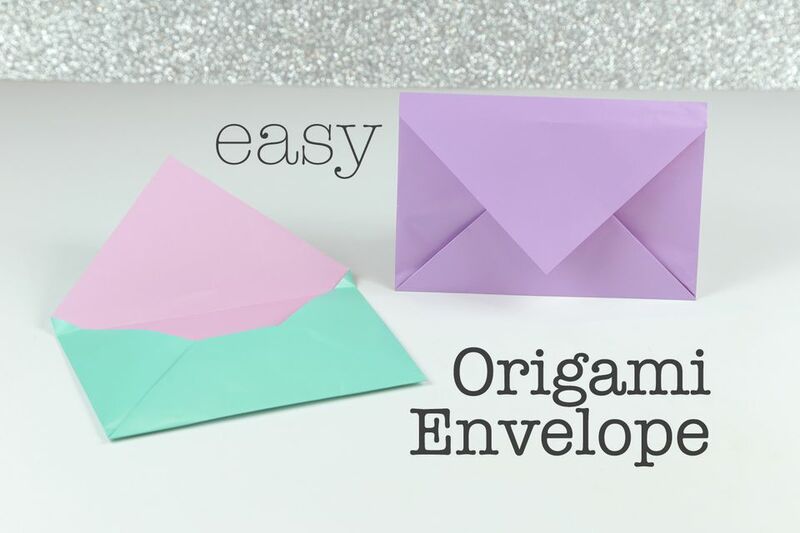 Learn how to make a simple origami envelope. This looks like an envelope that you receive greetings cards in. This envelope will add a great handmade touch to your gifts. This quick origami envelope is a great model to learn. You don't need any glue, the folding itself will keep the envelope secure, although you can use a bit of glue if you wish. Any time you don't have an envelope handy, you can just make one with this technique. You can use any kind of paper for the envelope. It can be the same wrapping paper you are using for a gift. Also think about using any kind of colored, patterned, or craft paper. Even simple printer paper or a brown paper bag will do. This technique is very handy if you have a greeting card to give but it doesn't have an envelope. You will be able to craft one in just a couple of minutes from any paper you have on hand. You'll need one sheet of square paper for this origami envelope. If your chosen paper is not square, trim it to square with scissors or paper cutter. Take the right corner over to the left corner and make a small pinch in the very center. Now take the bottom corner up to the top and make another small pinch in the center. This gives you an X mark. Fold the left and right corners to meet the center of the X. Bring the top corner to the center and make a light mark in the middle. You now have a crease mark. Fold the bottom corner up to the crease mark, keeping the left and right edges straight. Fold the right edge of the bottom section inwards, aligning with the crease you just made, and unfold. Fold the left side in the same way and unfold. Fold the bottom corner up to the crease that is indicated. Re-fold the lower right section. Take note of the X that is on the lower central flap underneath. The top right point of the X aligns with the top left corner of the flap on top. Open out the lower section, make a new mountain fold from the central flap, fold the right section underneath the central flap. The photos show how to make the mountain fold and the results. Re-fold the lower section back up. Insert the left and right flaps inside the central section that is now on the inside. You could use a dap of glue on the flaps to keep them secure. Your origami envelope is complete and ready to use. Fill it with your card, note, money, or anything that is flat that fits.